Comic Con 2015 is being held July 9-12, 2015 in San Diego. Thursday 9th July: The Supernatural Wiki hosted an off-site event for the SPN fandom on Thursday, July 9 called Carry On Wayward Cocktails. It was attended by 300 fans as well as Robbie Thompson, Adam Glass, Bob Berens, Jenny Klein, Ben Edlund and Curtis Armstrong. Sunday 12th July 11-12am: Supernatural panel. The panel featured Jared Padalecki, Jensen Ackles, Misha Collins and Mark A. Sheppard, along with executive producers Jeremy Carver and Andrew Dabb. It was hosted by Richard Speight and Rob Benedict. Saturday 11th: Jenny Klein was on a live Nerdist podcast recording. Saturday 11th 7pm: Rob Benedict and Richard Speight were part of the Thrilling Adventure Hour: Evolved panel. Nerd HQ: There was a panel on Sunday 12th at 2.30pm featuring Jared Padalecki, Jensen Ackles, Mark Sheppard and hosted by Aisha Tyler. Misha Collins had been scheduled to appear, but had flown to LA to spend some time with his family before returning to Vancouver for work on the Monday. TV Guide Magazine's Comic Con edition features a range of covers although not a Supernatural one in 2015. There is a feature on Supernatural in the issue. There is an official Comic Con bag. These are free to attendees at Comic Con. Cinequest have their annual Supernatural "Road to San Diego" exclusive t-shirt. This year they also have a die-cast Impalas accompanied by a little plastic army man as mentioned in 5.22 Swan Song. More info here. 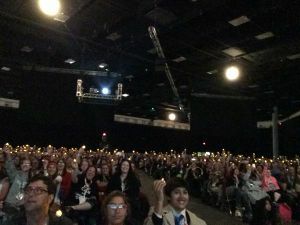 Fan Edit of cast reaction to #AKFHallH tea lights by Taylor K.
Ann distributed the 1185 of the tea lights to Supernatural fans as they queued for the Supernatural panel in hall H on the morning of Sunday 12th July, 2015 (the remaining tealights were given to the panellists, absent friends. one went to William Shatner, on whom GISHWHES team Ann had been. Following the main panel, as the audience questions began, the tealights were turned on and held high in the audience. 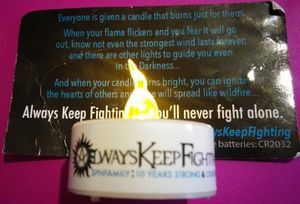 A note and tealight was passed to Jared on stage, who was visibly moved by the display. The action garnered wide media coverage. This page was last edited on 2 March 2019, at 04:03.